Bestselling author Woo Myung's messages on truth and inner peace are available on Kindle and other portable devices. Through his latest book, Woo Myung shares his unparalleled insights on what the human mind is and how to cleanse it to become the infinite universe mind. Woo Myung's teachings are the fundamental solution to achieving real peace in the world. 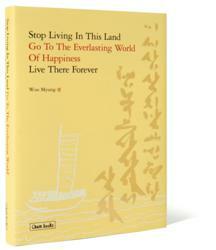 Woo Myung's much anticipated book, "Stop Living In This Land, Go To The Everlasting World Of Happiness, Live There Forever" has made its e-book debut on Kindle, Google Play Books, NOOK Books, and iBooks. Not long after garnering much attention and positive reviews, the hardcover version hit the Number One spot on the Amazon Bestseller list and 10 other categories during Thanksgiving week. During this holiday season, some of us may be anticipating the fun times to come while some wait with dread. The holidays often mean there will be inevitable family gatherings where ongoing conflicts and hard feelings may resurface. For many of us, being able to overcome these conflicts and finally forgive may be more valuable than receiving fancy presents. Woo Myung's latest book or e-book version may be the perfect unforgettable gift that can permanently change one’s life from dread, anguish, or even boredom to one of gratitude, understanding, and joy. Published by Cham Books, "Stop Living In This Land. Go To The Everlasting World Of Happiness. Live There Forever" reveals the secret on how to become liberated from one's deeply rooted conflicts, fears, and regrets which are the main source of unhappiness and stress. Woo Myung explains how his subtraction method enables one to unveil the truth within and thereby achieve everlasting happiness and inner peace. Woo Myung writes that we are all born to live in the world of truth. His unique method of subtraction can change the human mind to the infinite universe mind. Then one can be reborn as the universe mind and live eternally without suffering. This book delivers hopeful messages to those who are in pursuit of truth and happiness. The many losses and struggles that Woo Myung witnessed and experienced throughout his life instilled in him a yearning to find truth, everlasting peace and true freedom. After deep introspection about life and existence he attained enlightenment in 1996. He then founded Maum Meditation which spread by word of mouth and has expanded to over 330 centers worldwide and continues to grow. Since 1996, Woo Myung has been traveling extensively to reach people who are in search of truth and give lectures to the public. In 2012, he traveled to many major cities across North America, South America, Europe, Africa, Asia and Oceania. Over the past decade, he has given more than 340 lectures and countless talks around the world. Woo Myung is also a renowned author in South Korea and Asia and a bestselling author of 10 published books including "World Beyond World" and "The Way To Become A Person In Heaven While Living." For his efforts and contribution to the world, he was awarded the Mahatma Gandhi Peace Prize by the International Association of Educators for World Peace (IAEWP, UN-NGO). He was also appointed as World Peace Ambassador by the same organization. As Dr. Charles Mercieca, president of IAEWP states, "Woo Myung's teachings are the fundamental solution to achieving real peace in the world."